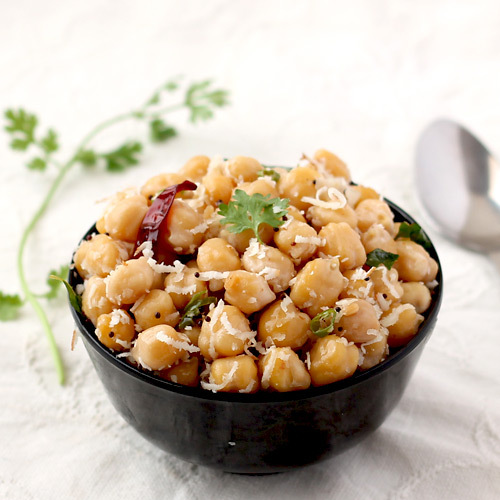 Channa Sundal, a healthy, low fat and low oil South Indian style protein rich snack, is generally served as prasadam after puja during religious festivals like Navratri and Janmashtami. 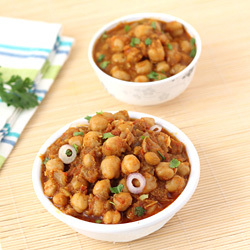 In this easy to follow step by step photo recipe’s traditional preparation, boiled chickpeas are stir fried with spices and then mixed with grated fresh coconut and raw boiled chickpeas make it more healthier as it retains all nutrients; You can use canned chickpeas to speed up the process (see tips) and do not have access to pressure cooker to cook the chickpeas. This appetizing side dish has dry texture and that makes it suitable to be served as a snack, starter or accompaniment. Drain water from soaked chickpeas. Pressure-cook them with 1-cup water and salt in a 3-liter capacity steel/aluminum pressure cooker over medium flame for 4-whistles. 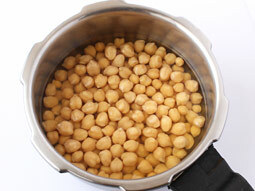 Chickpeas should retain their shape after pressure-cooking, so do not cook them for longer period otherwise they will turn mushy. Allow it to cool until pressure comes down naturally. Open the lid and drain water. Heat oil in a kadai over medium flame. 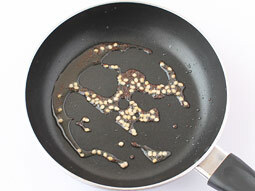 Add mustard seeds; when they start to crackle, add urad dal and sauté until it turns light brown. 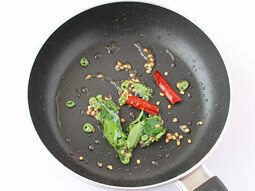 Add asafoetida, dry red chilli, green chilli, curry leaves and sauté for 20-30 seconds. Add chickpeas and salt (if required, because we have already added it to chickpeas while pressure-cooking in step-2), mix well and cook for 2-3 minutes. Add lemon juice and grated fresh coconut. 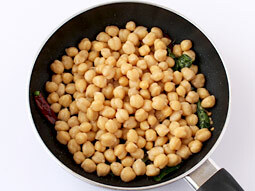 Stir well until chickpeas are coated well with masala. Turn off the flame. 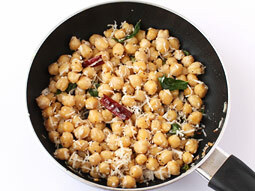 Transfer chickpea sundal to a serving bowl and garnish with finely chopped coriander leaves. You can also use canned garbanzo beans (white chickpeas) instead of dried chickpeas to speed up the process and reduce cooking time – drain excess liquid from canned chickpeas and add them in step-5. You can prepare various types of sundal in same way by replacing chickpea with peanuts (groundnuts), black chana, kidney beans (rajma), moong bean (green gram) or any other legumes or combination of grams. 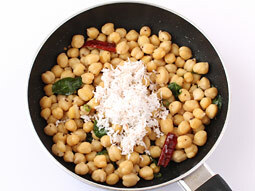 Adjust the quantity of green chilli to make channa sundal as spicy as you need. 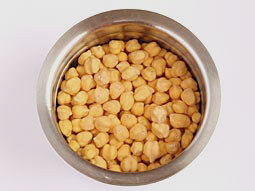 Serving Ideas: Serve warm chana sundal as a starter, an evening snack or as a side dish with meal in lunch or dinner. Pack it in your kid’s lunch box with chapati, puri or steamed rice. The tips were really usefull. The article is very usefull. The dish came out awesome. Everyone liked and thanks to author. For Bengali cholar dal the chanas required to get more boiled to get the gravy adequately thick. Followed exactly your process. Overall it was good. The pressure cooker is of 5 ltrs. Thanks.